A book can sit on the tbr shelves for years until it’s suddenly the right day to read it. Last week, I read a review of a movie called The Scarlet Tunic on the Costume Drama Reviews blog. The movie was based on the Thomas Hardy short story, The Melancholy Hussar of the German Legion. I have a couple of volumes of Hardy’s stories on the tbr shelves & I found the Melancholy Hussar in Wessex Tales which I bought in 2002. It was the right time to read it. I’m reading Gillian Gill’s biography of Victoria & Albert, but it’s a hardback & too heavy to take to work & carry on my lunchtime walk to the coffee shop. I needed a paperback & this week it was Hardy. Melancholy & fate are two words that I always think of when reading Hardy. I’ve read most of his novels & a lot of his poetry. The Mayor of Casterbridge & Far From The Madding Crowd are two of my favourite novels. I remember reading Jude The Obscure during a cold winter over 20 years ago, coming home from late afternoon tutorials in the city on the train in the dark, feeling more & more desolate. When I got to the saddest scene in the novel – if you’ve read it you’ll know what I mean – I almost lost the heart to go on with it. His stories often show fate at her cruellest. 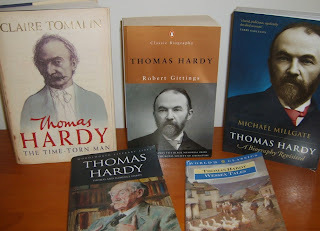 If you’ve read a little Hardy, you can predict how a story will go. I did that with this collection, but it doesn’t mean I enjoy the stories any less. 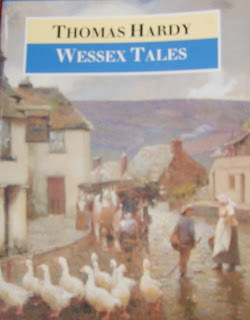 The Wessex Tales are rooted in the countryside of Wessex, Hardy’s name for the south of England, Dorset & Cornwall. He writes beautifully about country life & landscapes & country people from farmers to townspeople. I’ll give you an example of the way fate plays a part in his stories. It’s hard to write about the plot of a short story without giving everything away & I need to give everything away to show you what I mean so this is a SPOILER warning if you haven’t read The Withered Arm. Middle-aged Farmer Lodge has married a young bride & all the talk in the dairy is of the homecoming of the new bride & groom. One milkmaid, a little apart from the others, says nothing. Rhoda Brook knew Farmer Lodge years before & she has had his son although he has nothing to do with either of them now. She sends the boy out to have a look at the new bride and greedily gathers all the details of the new Mrs Lodge’s appearance & manner. One night she has a dream or vision in which she sees Gertrude Lodge almost as an incubus, a horrible crone, sitting on her chest, mocking Rhoda with her wedding ring & she violently grabs the creature’s arm & throws it onto the floor. She wakes with a start & thinks it was a dream but is disturbed to find that her son heard a noise in the night at the exact same time as she had her dream. Mrs Lodge visits Rhoda to bring her son a new pair of shoes (knowing nothing of Rhoda’s relationship with her husband at this point although she later learns the truth). Gradually, Rhoda is ashamed of her former feelings towards her & the women become friends. However, Gertrude’s arm shows the marks of a hand & the flesh begins to wither. She asks Rhoda to take her to visit a healer deep in the forest but he’s not able to help her & she gradually becomes estranged from her husband & obsessed with finding a cure for her deformity. Rhoda & her son move away & some years later, Gertrude Lodge has become a bitter woman, still looking for a way to win back her husband’s affection. She goes back to the healer in the forest & he tells her of an old remedy – laying the affected limb across the neck of a hanged man while the flesh is still warm. Gertrude is determined to try this last dreadful remedy. She bribes the hangman at Casterbridge to allow her access to the body of a young man due to be hanged the next morning for rick burning. She holds her arm across the neck of the dead man & her arm is cured. But, following the corpse is the boy’s mother, Rhoda Brook & his father, Farmer Lodge, who see it all. Rhoda shrieks at Gertrude, pulling her away from her son, she faints & never regains consciousness, dying three days later. Farmer Lodge leaves the area, never to return. Rhoda returns to her old home & her old work as a milkmaid, never speaking of her sorrow, impassive as ever. This is what I mean by fate. I knew as soon as the young man to be hanged was mentioned that it would be Rhoda’s son, fateful retribution for Rhoda’s role in Gertrude’s blighted life. I knew that Gertrude’s arm would be cured but at a terrible cost. All the stories in this collection have the same kind of inevitability about them, but Hardy writes so beautifully about relationships. Just because he would rather have a sad or ambiguous ending to his stories, doesn’t make them any less readable or interesting. 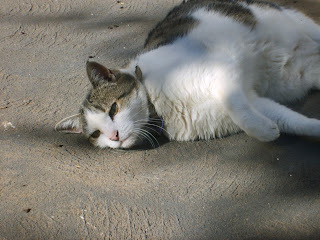 It's a very hot day. I put some washing on the line at 9am & brought it in at 10.30. Very gusty north wind BUT a cool change tonight which Abby & I will be looking out for. 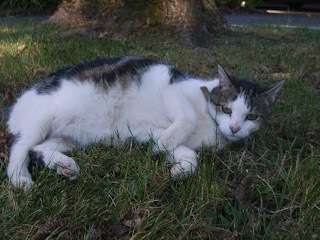 Abby took her usual tour of the front garden early this morning & spent some time eating grass & rolling around under a tree. 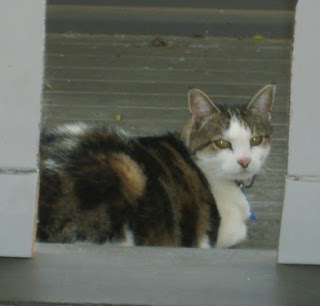 Not long after I took these photos, she was under the back steps in the coolest spot on a hot day, waiting for the change. I love reading about books. Sometimes I think I spend more time reading about books in journals & on blogs, than actually reading the books. One journal I can’t do without though is Slightly Foxed. I’ve been a subscriber since the beginning, about five years ago. Slightly Foxed isn’t interested in the latest bestseller or celebrity biography. The books they review are rarely new & often not even in print. Slightly Foxed reviews books that may have slipped under the radar or fallen out of favour or fashion. Their reviewers are passionate about their choices. These are books they care about, they want to see them in print again or at least bought secondhand & read or read before they fall out of print. I always come across either an old favourite – recently 84 Charing Cross Rd by Helene Hanff & Sarah Caudwell’s detective novels – or something that sounds so enticing I have to read it – John Buchan’s Richard Hannay novels & James Hilton’s Lost Horizon – or usually both. They’ve also started reprinting beautiful little hardback Slightly Foxed Editions of memoirs by writers like Rosemary Sutcliff, Diana Holman-Hunt & V S Pritchett. Like Persephone Books, Slightly Foxed, the journal & the Editions, are beautiful objects as well as being absorbing reading. Thick, creamy paper (why don’t more publishers use it? So much easier on the eye than dead water flimsy paper) & the perfect size to slip into a handbag or pocket. Barbara Pym is one of my favourite authors so I’m very glad that Virago has started reprinting her books. After a successful career in the 40s & 50s, she was out of fashion for most of the 60s & 70s until Philip Larkin & Lord David Cecil named her as an unfairly neglected author in a newspaper article & her novel, Quartet in Autumn, was published & shortlisted for the Booker Prize. Her novels came back into print & after her death in 1980, unpublished work, diaries & a biography by her friend & literary executor, Hazel Holt, was published. Virago has so far reprinted Excellent Women, Jane & Prudence, A Glass of Blessings, No Fond Return of Love, & Some Tame Gazelle. Less Than Angels is coming out in a couple of months. It seems Barbara Pym’s time has come around again. I think it’s because of this renewed interest in middlebrow fiction. Publishers like Persephone, Virago, Greyladies, Capuchin Classics & Vintage have been reprinting authors who were popular in the 30s & 40s but then faded from view. The strengths of these novels are the emphasis on the domestic, the involving plots, the characters & the details of lives that are different enough from ours to be fascinating. I’ve just reread Jane & Prudence, one of my favourite Pyms. I sat down yesterday afternoon looking for a change from Queen Victoria, & before I knew it I was deep into the story & up to the scene where Jane, a scatty, not very successful vicar’s wife, is standing in a department store looking longingly at the terrines of foie gras & asking a resplendent shopman in uniform how a vicar’s wife can possibly afford such luxuries? Of course, the answer is that she can’t, so she goes off to have lunch with her friend Prudence instead. Barbara Pym’s humour is in such moments. She shows us the silly moments of ordinary life, especially in characters like Jane, who’s fond of quoting bits of 17th century poetry to herself & quite unconcerned that her housekeeping skills are practically non-existent. Prudence is a former student of Jane’s, almost thirty, & fond of unsuitable love affairs which really don’t disturb her emotions very much at all. Jane & her family have moved to a country parish & she decides that there are several eligible men suitable for Prudence so she decides to do a little matchmaking. Pym’s men are often unsatisfactory, actually, they always are. I can’t think of one man in any of the books who she isn’t poking fun at. That’s what is so attractive & funny about her books. Her women are often the neglected ones, the spinsters, the widows, the unattractive, “holy fowl” as Helena Napier describes them in Excellent Women. But, their lives are as happy & fulfilled, sometimes more so than their married sisters. Belinda & Harriet Bede in Some Tame Gazelle are happy spinsters, each rejecting truly awful marriage proposals. At the end of the book, Belinda is relieved that their lives will go on as always. She will mildly love Archdeacon Hoccleve as she has for the last 30 years & Harriet will have a new curate to fuss over, “...they would hardly realize the difference, except that he was rather Italian-looking & had had a nervous breakdown.” I won’t go on, I could quote something from nearly every book. 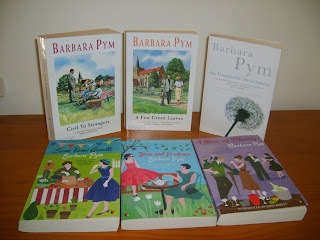 Barbara Pym is an author I can reread with pleasure & used to listen to on audio. Chivers Audio (now BBC Audio) recorded audio books of all the Pyms on cassette, but they’ve long since been withdrawn from my library. When I read the books now, I hear Susan Jameson reading A Glass of Blessings, Julia McKenzie reading Some Tame Gazelle & Juliet Stevenson reading Excellent Women. I hope they release them on CD as part of the Classics on CD range. I love audio books, I always have one on the go in the car. A subject for another post. 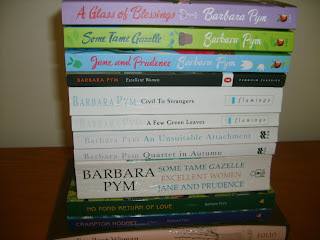 There's a copy of Jane & Prudence, and many other books by Barbara Pym, available at Anglophile Books. Apart from reading, I also love cooking. 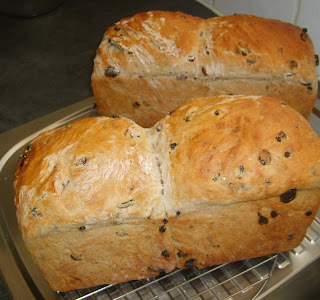 I've just made some raisin bread to take into work for morning tea tomorrow. 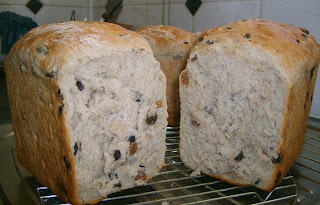 Everyone loves raisin toast & I love baking bread, it fills the house with that lovely spicy, yeasty smell. Lytton Strachey was a writer & critic who had an overnight success with his book, Eminent Victorians, published in 1918. The four short biographies of Florence Nightingale, Cardinal Manning, General Gordon & Thomas Arnold swept away the traditional Victorian three volume biography & ushered in a new, freer, less respectful style of biographical writing. Strachey’s book was a reaction to the Victorian hagiographies of great men, often written by their widows or acolytes, which smoothed over any rough edges of the subjects life. Only one example is the five volume life of Prince Albert that Victoria commissioned after his death. Strachey’s Queen Victoria (1921) has no false flattery or submission to his subject. The book is full of sly humour, mostly at the expense of the great & good of the period. He quotes liberally from the Creevey Papers & the Greville Diaries, two men with access to the Court & a sardonic eye for a good story. Victoria comes across as a bouncy young girl with a boisterous sense of humour, rather too fond of laughing & showing her gums. More Regency in temperament than what we think of as Victorian. The chapter on Victoria’s relationship with Lord Melbourne, her first Prime Minister, is quite moving. The young Queen, who had never known her father & had grown up in Kensington Palace with her foolish mother, never alone, with only her governess Baroness Lehzen for support, was determined to reign alone but realised that she needed help. Lord Melbourne was rejuvenated by the adoration of Victoria & he guided her through those first months of her reign. Then, along came Albert, whose influence Strachey sees as responsible for the increasing starchiness of Victoria’s Court. With their marriage, Albert gradually became the centre of Victoria’s life. He became, in effect, her Private Secretary & chief advisor. He revolutionised the badly run Royal palaces & was the architect of the Great Exhibition. Through all this, Victoria supported & admired him. All her life she wanted to have someone to lean upon. First Lehzen, then Lord Melbourne, then Albert. After his death at the early age of 42, she was devastated. The well-known story of her long seclusion in widowhood & her late return to public life & popularity is well-told. Her relationship with her Prime Minister Benjamin Disraeli is dwelt upon in all its absurdity as well as its genuine affection. Disraeli laid on the flattery “with a trowel” as he said & he charmed & beguiled Victoria . She sent him primroses she had picked herself & was delighted when he insisted on her assuming the title Empress of India. Strachey doesn’t go into her relationships with her children in any detail apart from the story of her fraught relationship with the Prince of Wales. He depicts Victoria as a woman with all her faults but he tries to understand the influences on her character that resulted in the stubborn, tyrannical, passionate personality of the Queen. Amazing to think it was published only 20 years after her death. 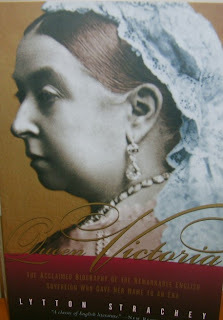 Next up is a new biography of Victoria & Albert by Gillian Gill called We Two. Ninety years on from Strachey, will this be a radically different view of their relationship? 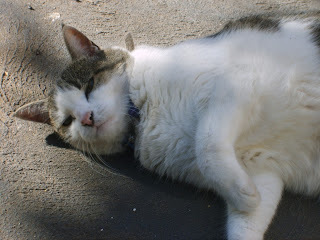 Abby was relaxing in one of her favourite sunny spots just outside the back door when I appeared with my camera, started crawling around the laundry on my stomach looking for a good angle & disturbed her peace. She looks at me with amazement when I do this but she's obviously decided it's just one of my eccentricities & she's willing to indulge me. Gladys Mitchell was one of the lesser Queens of Crime of the Golden Age. Never as popular as Agatha Christie or Dorothy L Sayers, she was prolific, writing more than 60 books. Vintage have begun republishing her books & I’ve just read The Saltmarsh Murders. I read the first half in fits & starts so I found it quite hard to work out who was who. As Martin Edwards blogged earlier this week, I’d have been quite grateful for a cast list at the beginning! Yesterday afternoon I read the rest of the book. Apart from a horribly stereotypical portrait of a black manservant, Foster Washington Yorke, (the book was first published in 1932) the characters were the typical inhabitants of an English village mystery, although they’re all either eccentric or unpleasant. Narrated by the curate, Noel Wells, the mystery concerns the murder of Meg Tosstick, the former maidservant at the Vicarage, who was dismissed for being pregnant & was murdered nearly a fortnight after the birth of her baby. The baby has also disappeared. Meg wouldn’t talk about the father of her baby, except to say that it wasn’t Bob Candy, her former admirer. Speculation is increased when the baby isn’t seen by anyone except Mrs Lowry, the owner of the pub where Meg took refuge. Some even doubt there was a baby. Meg was murdered on the evening of the August Bank Holiday fete, so there’s ample opportunity for confusion over alibis. The police arrest Bob as Meg had refused to see him & his only chance to see her was on that night as he was barman at the pub & the owners were at the fete, leaving Meg unguarded. He admits he did see her & they talked but she wouldn’t tell him who the father of the child was, & he left her alive when he went downstairs to work. Another young woman also disappears, apparently after an argument with her volatile boyfriend & this only adds to the plot. There’s an exhumation, a search of a nearby stone quarry, a trial & a village concert, before the truth is revealed. 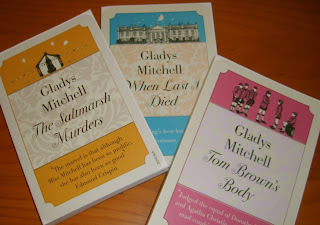 Mitchell’s detective is Mrs (later Dame) Beatrice Adela Lestrange Bradley. She’s staying at the squire’s house & Noel enlists her help in tracking down the murderer. Mrs Bradley is a psychologist, has been married & widowed twice, & is the most eccentric & intelligent person in the book. One aspect of the writing annoyed me, the constant references to Mrs Bradley’s strange appearance. She’s constantly compared to a serpent or a crocodile, she cackles & shrieks continually & clutches at people with a skinny yellow claw etc etc. This is an early book in the series which began in 1929, so I hope Mitchell toned down these constant references in later books. Mrs Bradley is brilliant at deducing just what’s going on, often using her psychological training to determine motive or the probability of a suspect’s guilt. I found the device of Noel, the naive curate, as narrator a bit confusing too as he threw up his absurd theories for Mrs Bradley to demolish with a cackle or a shriek. 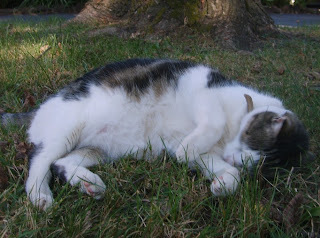 He also did a lot of confused running around, interspersed with making love to the Vicar’s niece, Daphne. I have two more books in the series to read, Tom Brown’s Body & When Last I Died. They were written later in the series & I’ll be interested to see how the books progress. If you’ve read all of Christie, Sayers, Marsh, Allingham & Tey & are looking for more from the Golden Age, Mitchell may be the answer. I’ve just watched the new BBC production of Emma. I’m glad I read the book again recently because I found I liked Emma better this time than ever before so I was predisposed to enjoy the series. Romola Garai was a lovely Emma. She portrayed Emma’s unconscious snobbery & frustration with the inanities of village life as well as the loving care she shows her father. Jonny Lee Miller was wonderful as Mr Knightley, one of my favourite Austen heroes. He did a lot with just a glance. Mr Knightley’s reactions to Frank Churchill, Jane Fairfax, Harriet Smith added so much that you sometimes miss when reading the book because you’re so focussed on Emma. Christina Cole was a suitably snobbish, self-absorbed Mrs Elton. The production looked gorgeous, the costumes were beautiful, such lovely clear strong colours. In one of the extra features on the DVD, the designer said she didn’t want a washed-out muslin look to the production & she certainly achieved that. It was especially interesting to see how Harriet’s clothing copied Emma’s as their friendship developed as a symbol of Emma trying to remake Harriet in her own image. The final episode was especially moving as Emma realises her love for Mr Knightley & sees the harm she has done to Harriet &, she thinks, her own happiness, by their friendship. How do you choose your next book? Sometimes a new book just bought or just borrowed from work leaps over the entire tbr pile in a single bound & demands to be read. Sometimes the next book seems to lead on quite naturally from the book just finished. My next book is often chosen because of a recommendation from my online reading group. I’ve been a member for five years & we’re a small group of about 30. Some of us post almost every day, some join in when they have time or when a book or author sparks a response, usually along the lines of “Oh, I love her, have you read...”. 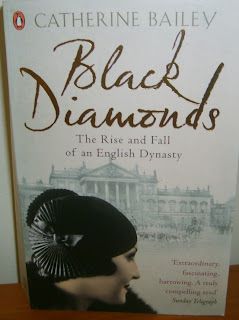 Black Diamonds by Catherine Bailey (reviewed below) was the result of enthusiastic raves from two of our members. I bought it some time ago on the strength of that but another mention recently sent me running to the shelves to find it & read it. In the last couple of days, Elizabeth Von Arnim’s All The Dogs Of My Life & Lytton Strachey’s Queen Victoria have been read & recommended. I have the Strachey so that’s moving towards my reading table tbr pile & I read the Von Arnim years ago but would like to read it again even though I’m a cat person rather than a dog lover. Another member of the group discovered P G Wodehouse last year & has been raving about Jeeves & Bertie Wooster ever since. I’ve picked up a remaindered copy of The Inimitable Jeeves very cheaply & will be reading it soon. The same person is my infallible guide to any BBC classic serial shown in the UK. We don’t see these in Australia for at least a year after they’re broadcast in the UK so I rely on Elaine to advise me about buying the DVD or just waiting to see it on TV. I’ve just watched the new Emma which I bought on her recommendation (review shortly) & in past years I’ve enjoyed Jane Eyre, Cranford & Little Dorrit months before they were shown on TV here. Little Dorrit still hasn’t made an appearance. So, how do you choose the next book? Serendipity or according to a strict system – first bought, first read? Or whichever book you happen to trip over in the hallway because your bookshelves are overflowing & you have nowhere to put it? The black diamond of the title is coal. This is the story of the Fitzwilliam family of Wentworth House in Yorkshire, one of the wealthiest aristocratic families in England in the early 20th century. It’s the story of how the family’s lives were intimately connected with the coal mines they owned & the miners they employed. It’s also the story of the family’s spectacular fall from grace so that by the 1950s, the last two male heirs were in the courts disputing the legitimacy of one of them. The book opens with the funeral of the 6th Earl Fitzwilliam in 1902. He was one of the richest men in the country, but the pomp & ritual of his funeral was marred by the fact that virtually none of the family were speaking to his grandson, Billy, the new Earl, because they believed him to be an imposter. Billy’s father, Lord Milton, son of the 6th Earl was epileptic. This carried a terrible stigma of mental instability in the 19th century. Milton was sent out to the United States as he was seen as an embarrassment to the family. He took his young family with him & while they were in Canada, his son & heir, Billy, was born. Milton’s parents had done everything they could to prevent him marrying, even to the extent of telling potential brides of the “taint” of his epilepsy. When he did marry & have a family, his father was horrified &, after Milton’s early death, rumours spread that, in the wilds of North America, a boy had been substituted for the female child actually born. In 1902, the family decided not to go to court to settle the question. They were far more frightened of scandal than the thought of an illegitimate Earl. The story of the Fitzwilliams is full of stories like this. It’s also a story of contrasts. George V paid a visit to Wentworth House in 1912 when discontent in the North was worsening. He wanted to see the conditions of the mines for himself & even took a tour underground. At the time the royal party was at Wentworth, two explosions ripped through the Cadeby Main colliery, not far away. The first explosion killed dozens of men. The second explosion killed many of the rescuers who had volunteered to try to reach the trapped men. This is the most effective part of the book. The story alternates between the eyewitness accounts of the disaster & the reactions of the King & Queen, the local community & the whole country. The contrast between the party at Wentworth House, where there were eight sittings of dinner for the servants according to their rank in the household, & the poverty of the miners & their families is compelling. The Fitzwilliams were one of the more enlightened mine owners. They hadn’t employed a company to run their mines, they oversaw them closely & their employees were well looked after by the standards of the time. Safety was paramount, unlike most other mines which were run for profit & the miners were expendable. This is not just another story of aristocratic goings-on. The servants, miners & their families are just as much a part of the story as the aristocrats. Catherine Bailey has done a remarkable job of piecing together the story of the Fitzwilliams, especially as they destroyed practically all their personal papers. Often only one stray letter or piece of evidence remains for her to reveal the truth of the many scandals in the family’s past. It’s an impressive work of detection. 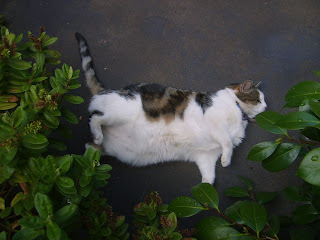 Abby relaxing in the front garden this time, between a camellia & a hebe. You can see by the droplets of lovely rain on the camellia that we had showers last night after a cool change. You may also be able to see a little burning on the camellia's leaves thanks to the very hot day we had on Monday. It's a cliche that Melbourne gives you four seasons in one day but we've certainly had our share of seasons this week. 43 degrees on Monday followed by the hottest night for a century & a prediction of snow on the Alps tomorrow. 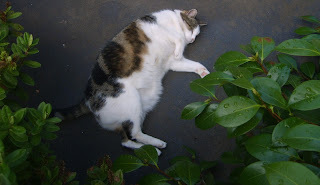 Today is a lovely 20 degrees & Abby enjoyed a stroll in the garden followed by a snooze on the front door mat in the sun. Simon from Stuck in a book tagged me for this meme earlier this week. The idea is to close your eyes, choose 10 books at random from your shelves & write about them – where they came from, what they say about you. Well, I cheated a little. 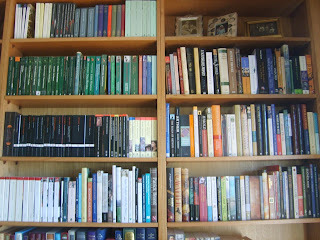 As my blog is new, I thought I would deliberately choose 10 books with my eyes open to describe my reading life over the past 30 years so that visitors have a better idea of who I am & what this blog is going to be about. The other point is that these are only the books I’ve kept. I’ve weeded hundreds of books from my collection over the years. So, there’s now no evidence of my passion for historical fiction – all those Jean Plaidys & Victoria Holts have long gone. All my school & university textbooks have gone unless I really enjoyed reading them, so only a few classic novels made the cut. So, here’s the list from the books I own now. The Penguin Book of First World War Poetry – I’m fascinated by the writers of WWI. Owen, Sassoon, Gurney, Rosenberg. This anthology, edited by Jon Silkin, has a lengthy introduction putting the work & the writers in context. The Daughter of Time by Josephine Tey – a tribute to my love of history & classic crime fiction. I’ve read this book at least a dozen times. It sparked a passion for Richard III that I’ve modified over the years & led to joining the Richard III Society & reading widely about medieval England. William : an Englishman by Cicely Hamilton – Well, there had to be a Persephone! This was one of the first Persephones I bought. As I said in a previous post, Persephone has been my most important literary discovery of the last 10 years. Nicholas & Alexandra by Robert K Massie – I first read this in one of my Dad’s Readers Digest abridged volumes. They came out every month with 4 abridged books in each volume. I read the abridged version over & over again until I came across this copy in a bookshop in the mid 70s. It lead to a fascination with Russian history which was also sparked by a children’s book which I borrowed from the school library & read many times & have never seen since, The Youngest Lady in Waiting by Mara Kay, about a young girl at the court of Nicholas I during the Decembrist revolt. Selected poems by John Donne – One of my favourite poets. This could have just as easily have been Byron, Keats or Emily Dickinson. This slim Penguin has travelled with me & been read & reread many times. I don’t read as much poetry now as I used to but Donne is a fond memory, especially the songs & sonnets. Testament of Youth by Vera Brittain – I remember reading this book over Easter, it must have been around 1980 as this copy has a still from the TV series on it. I was totally absorbed in this wonderful book. Vera’s experiences in WWI & the loss of so many of her loved ones made a deep impression on me. It started my love of the writing of the period, not just the war but the between-the-wars period when it was written. I’ve since read Vera’s diaries & some of her fiction. An inspiring woman. Ladies in Waiting by Dulcie M Ashdown – Another historical book. This is here because it was one of the first books I remember saving up to buy. I had to go into the city several times a year as a child to see an eye specialist. There was a bookshop on Collins St & I would go in each time & look longingly at this book, saving up & always hoping it would still be there. I finally bought it. It cost all of $14.95, but it was the mid-70s & I had to save my pocket money. 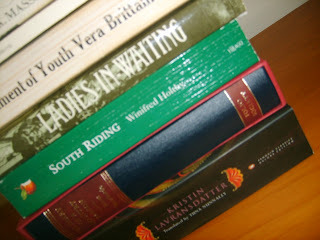 South Riding by Winifred Holtby – There also had to be a Virago in the pile. I’ve been reading Viragos since the compaby began & discovered so many favourite writers between the beautiful green covers. Besides Vera & Winifred, there’s Elizabeth Taylor, Elizabeth Von Arnim, Rosamond Lehmann. The list goes on. Now, the list wouldn’t be complete without a couple of titles from the tbr shelves. The Diary of a Country Parson by James Woodforde – This is a beautiful Folio Society edition. I’ve been a member of the Folio Society off & on over the years. Their books are always beautifully produced & illustrated. I love journals & letters & I will get to the parson one of these days. Kristin Lavransdatter by Sigrid Undset – My dear friend Dani at A Work in Progress read this a couple of years ago, wrote about it so persuasively that I bought this gorgeous Penguin edition with every intention of reading it immediately & haven’t started it yet. So that’s the list. I could have chosen another 10 books quite easily. It would be interesting to do a list just from the tbr shelves. Why did I buy it? Do I have any real intention of ever reading it?? There’s always my retirement, I suppose. I’ve been back at work for a week now, and, apart from enduring Melbourne’s hottest night for 100 years on Monday, it hasn’t been too bad. I love my job, my only complaint is that it interferes with my reading. I have finished a book this week though. To Bed With Grand Music by Marghanita Laski is one of the latest publications from Persephone Books. One of Persephone’s strengths is the wide range of writing about WWII that they’ve published. Short stories by Mollie Panter-Downes, the wonderful diary, Few Eggs & No Oranges by Vere Hodgson & novels like Saplings by Noel Streatfeild & A House In The Country by Jocelyn Playfair. To Bed With Grand Music is a very different view of the war to the stiff upper lip of Vere Hodgson & the nobility of Cressida in A House In The Country. Deborah & Graham tearfully say goodbye before he’s posted overseas. He doesn’t promise to be faithful to her but says he would never let another woman replace her in his heart. Deborah is living in a country village with their son, Timmy, & faithful housekeeper, Mrs Chalmers. Deborah is very young & soon finds village life too constricting. She gets a job in London, moves in with Madeleine, a sophisticated friend from student days, & swears fidelity to Graham, spending her evenings alone in the flat while Madeleine goes out with a succession of men. When Deborah meets Joe, an American Lieutenant, she begins an affair with him in a glow of romantic feelings. She still feels loyal to Graham, & Joe is loyal in his way to his own wife, but Deborah realises that she’s becoming frustrated & bored with her life & she gradually succumbs to the little luxuries Joe can provide. When he’s posted overseas, Deborah is sure she’ll never have another affair, but soon she’s going out with Sheldon Z Wynuck, another American officer, but a step down in class & sophistication from Joe. Then, she meets a suave Frenchman who teaches her, at her request, how to be a good mistress. Then there’s a Brazilian & a friend of her husband’s who looks her up when he’s on leave... Deborah’s moral sense has completely abandoned her by this time. 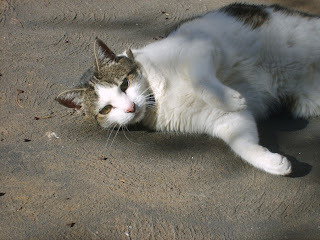 She has also virtually abandoned Timmy, who is looked after by Mrs Chalmers & hardly sees his mother. Deborah’s own mother, Mrs Betts, has abandoned her daughter to her fate by this time, only intent on seeing that her grandson is cared for. Mrs Betts’s attitude to Deborah struck me as quite unfeeling. She’s only in her early twenties at the beginning of the war but her mother does very little to guide her when she realises how her daughter is living in London. Mrs Betts allows Deborah to rationalise her desire to leave Timmy because she sees that he’s happier with the housekeeper than with his moody mother. She seems to blame Deborah’s dead father for this tendency to lax morals & washes her hands of her, apart from paying her debts at one point. The ending of the book is ambiguous. The war has ended, Graham will be coming home, but will their marriage survive? I find it fascinating that the book was published so soon after the war (1946). It wasn’t well-reviewed & it’s easy to see why. The picture it paints of women living the high life while their men were serving overseas is not the image Britain wanted to see. Deborah is selfish, self-seeking & predatory by the end of the book, but I have some sympathy for her. Left alone with a small child while her husband has a cushy posting in Egypt, no support from her mother, few friends & no inner resources to fall back on, it’s not surprising to see her downward progress. I'm going to write the occasional post about an author or publisher or journal that has changed the way I read. The first one just has to be about Nicola Beauman's Persephone Books. One of the luckiest internet searches I ever did was about 10 years ago. 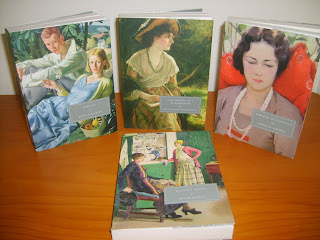 I was looking for the Virago website (turned out there wasn’t one then) & found Persephone Books instead. Nicola Beauman had started Persephone just the year before to reprint the books she wrote about in her book A Very Great Profession, published by Virago in 1983 & reprinted by Persephone last year. Middlebrow novels, books that were sneered at when they were first published by some critics & had fallen out of favour since. Books that were incredibly popular & much loved. Books written mostly by women & mostly in the period 1900-1950. Books that have a less stridently feminist tone than the Feminist novels reprinted by Virago. Domestic novels - & short stories, diaries, letters & non-fiction as well. There were maybe 10 books published when I found Persephone & I couldn’t wait to get my hands on them. I ordered my first three, Good Evening, Mrs Craven by Mollie Panter-Downes, William : an Englishman by Cecily Hamilton & Julian Grenfell by Nicholas Mosley. I gobbled them up & bought three more, & three more... Now I have them all & a standing order for the new titles. The books themselves are beautiful. I probably don’t even need to describe them as a Persephone has become proverbial for a beautifully designed book, lovely to look at & hold. The plain dove grey covers with cream panels, the endpapers chosen to match the period of the book, the creamy paper, the introductions & afterwords written by distinguished writers & critics. Still, none of this would matter if the contents weren’t so exciting, so unputdownable. Persephone Books has broadened my reading & given me the most pleasure in my reading life over the past 10 years. 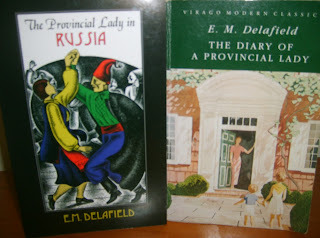 I’ve discovered Dorothy Whipple (my favourite Persephone author), Susan Glaspell, Marghanita Laski, R C Sherriff, Vere Hodgson & the adult novels of children’s authors Richmal Crompton & Noel Streatfeild. Reading Persephones has led me down many reading paths & introduced me to the online reading group I’ve been a member of for the last five years & couldn’t live without. 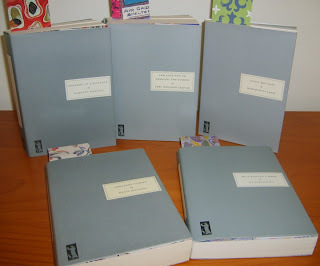 They also publish the lovely Persephone Classics, their bestsellers with bookshop-friendly covers. 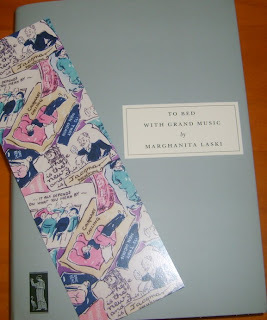 I’m half way through reading To Bed With Grand Music by Marghanita Laski, reviewed here & here. It’s a fascinating look at a side of the Home Front we don’t often see in books or movies about WWII. Deborah is a total contrast to the noble Cressida in Jocelyn Playfair’s A House in the Country (Persephone). This is certainly not Vere Hodgson’s spirit of the Blitz but all the more interesting for that. I finished Emma last night & enjoyed it very much. Emma isn’t quite as spoiled as I’d always thought her. She does make mistakes but then a perfect heroine would be boring. She’s almost set up for failure by being described as rich, handsome & clever in the first sentence. I think that’s what has always got me offside in the past. And the first half of the book, with her schemes for Harriet & her unfriendly attitude towards Jane Fairfax, does annoy me. But, by the end, I couldn’t help feeling that her errors are on the side of friendship & love – except maybe her jealousy of Jane Fairfax but that springs from an acknowledgment of her own laziness & lack of application. There are lots of other things to admire in Emma apart from the heroine. Mrs Elton is appallingly wonderful. She & Mr Elton truly deserve each other. Mr Woodhouse is as tyrannical as ever in his own way. It’s interesting that Emma does everything she really wants to do while still soothing her father & making him think it was all his own idea. Very clever, but then she’s had a lifetime’s practice. So, I enjoyed Emma more this time than I ever have before & I’m looking forward to watching the BBC series when it pops through my letterbox. Morland Dynasty - is it the end? Elaine at Random Jottings has just posted about the demise of Cynthia Harrod-Eagles’ Morland Dynasty series of historical novels. Not because Harrod-Eagles has decided to stop writing them, but because her publisher refuses to publish them anymore. The Morland Dynasty was one of the first series that I just could not get enough of. I read a lot of historical fiction in my teens. I think Jean Plaidy & Cynthia Harrod-Eagles inspired my love of English history & led me to read non-fiction history as well. Actually, the non-fiction has taken over from the fiction & I don’t read much historical fiction any more. But, without the Morlands, I may never have started on this journey. I agree with Elaine that the publishers, Little, Brown, need to get behind the series & jump on the history bandwagon that Philippa Gregory et al with all those headless women on book covers have made their own. Cynthia Harrod-Eagles is a fantastic writer. I love her Bill Slider detective series (the latest, Fell Purpose, came out just before Christmas & is a terrific read), & if Little, Brown stick to their decision to drop the series, I hope another publisher will see the great potential in this series. I’m nearly halfway through my reread of Emma. I’ll never be as fond of Emma as I am of Anne or Elinor but this time I’m trying to read with an open mind. It was very perceptive of Jane Austen to write ”I am going to take a heroine whom no one but myself will much like. “ She may have been joking but Emma is not easy to like when she’s being a snob. But, she’s endlessly kind to her father, smoothing away every difficulty & always thinking of his comfort. I enjoyed the way she manages to make sure all her guests have enough to eat even though her father advises them to eat as little of possible of everything for the good of their health. I love the scenes with Mr Knightley, the dialogue just crackles along & it demonstrates the equal relationship they have. This time I’m taking more notice of how Emma feels about her mistakes. The excruciating proposal from Mr Elton was as funny as ever, but this time I took note of Emma’s feelings when she’s safely back in her room, mortified by her own blindness & sorry that her misunderstanding will lead to pain for Harriet. She is a good friend to Harriet, she’s fond of her & wants her to make a good marriage but she is reluctant to accept that Harriet’s illegitimacy is going to have an effect on how high she can rise in society. Her snobbish disdain for Robert Martin still made my blood boil, but, after he meets Harriet at Ford’s, Emma does admit the good manners & real feeling he displays. She is willing to alter her opinions, she’s never blindly fixed, although she’s reluctant to admit (to Mr Knightley if not to herself) that she has made a mistake. So, like Emma, I’m willing to admit that my opinion of Emma is changing for the better. Frank Churchill has just made his appearance so we’ll see if my improved opinion lasts through the awful party when Frank teases Jane (much to Emma’s delight) & the picnic at Box Hill. I had an unfortunate introduction to Ronald Blythe. I had to read his classic account of English village life, Akenfield, at high school & I didn’t enjoy it at all. I think teachers have a lot to answer for. How many people do you know who have been put off Shakespeare, Jane Austen etc because they were forced to read them at school? Luckily, I wasn’t put off Shakespeare by being forced to sit through the class laboriously reading Macbeth aloud (and it’s still my favourite Shakespeare) but I think I’m the exception to the rule there. Apart from poor Ronald, I’ve never been able to read John Steinbeck after reading The Grapes of Wrath in Form 5. Akenfield was published in the late 60s & Ronald Blythe has been writing about the countryside ever since. I’ve just read the first two collections of his weekly columns for the Church Times, Word From Wormingford & Out Of The Valley. Blythe is a Reader in his parish which consists of three congregations at Wormingford, Mount Bures & Little Horkesley. 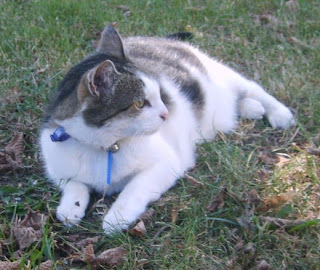 The books follow the seasons & the liturgical year with observations of the natural world, parish matters, the garden & the adventures of Max the cat. The Stour Valley has artistic connections. It is Constable country, Gainsborough was born here & Blythe knew the artist John Nash who lived in the area. He also loves the poetry of John Clare & as president of the John Clare Society is in demand to give talks about the poet. I enjoyed the gradual feeling of learning about the parish. Ronald Blythe spends quite a bit of time walking & meditating on life, his past & the changes that modern times have brought to his village & the Church. I read the books straight through but I think they could also serve as books to dip into as the seasons pass just to glean a little bit of country wisdom from a long life well lived by a happy man. I have a confession to make. 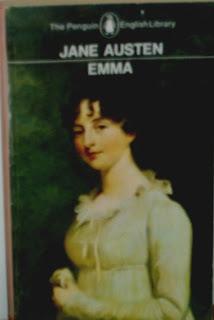 I love Jane Austen but I don’t like Emma Woodhouse. Emma is universally agreed to be Jane’s masterpiece & I love the plot, the other characters, the village setting, but Emma irritates me. 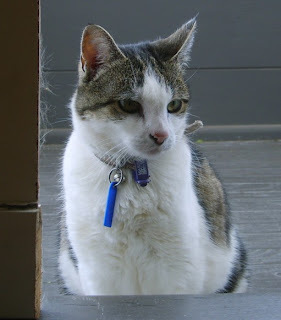 She’s spoilt & self-satisfied & interfering & I just want to shake some sense into her. 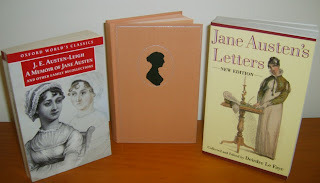 My favourite Austen is Persuasion, closely followed by Sense & Sensibility and Pride & Prejudice. But, the beauty of Jane is that there’s always something new to discover in the books. I’ve reread all the novels over the past year & I was surprised to find that Fanny Price wasn’t the insipid, self-effacing girl I’d always thought her. This time, I discovered the jealousy in her thoughts about Mary Crawford & Edmund and admired her determination to resist Henry Crawford against the persuasions of everyone else. So, I’m about to start yet another reread of Emma in the hope that I’ve matured enough to appreciate her. 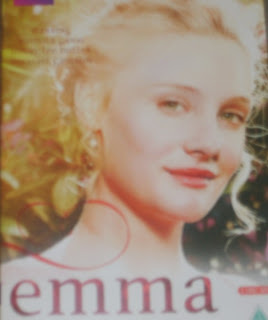 I have the latest BBC version of Emma on the way from Amazon & I’d like to read the book again before I watch it anyway as I like to have the book clear in my mind before watching the TV version. I’ll let you know how I get on. I’ve made New Year reading resolutions in the past. 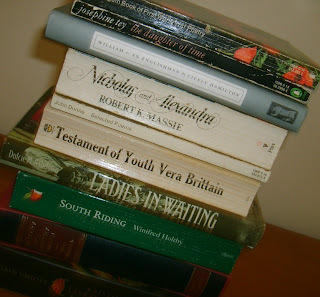 Some I’ve kept – in 2008 I decided to reread four of my favourite historical biographies, books I read over & over again in my teenage years but hadn’t read since although I’d read a lot more about the subjects of them all. 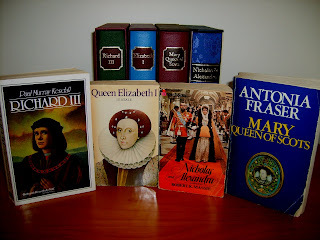 The books were Richard III by Paul Murray Kendall, Elizabeth I by J E Neale, Mary Queen of Scots by Antonia Fraser & Nicholas & Alexandra by Robert K Massie. 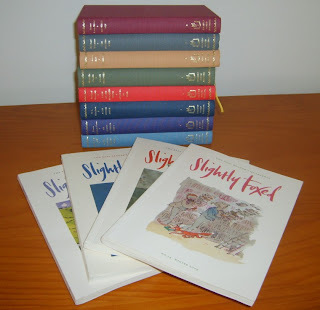 I’d bought beautiful Folio Press editions of all these over the years & I read these at home, taking my battered old original paperbacks to work for lunchtime reading. I loved it. All of these books were like old friends, I’d read them so often & I enjoyed so much reading them again. So, that was one resolution I kept. Last year, I was going to read several books on the English countryside that had languished on my tbr shelves for too long. I didn’t pick up any of them. 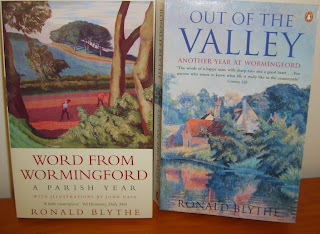 I’ve just read two of them, both by Ronald Blythe, & I’ll blog about them soon. I think the problem with this resolution was that much of what I read is English so these books didn’t stand out as enough of a challenge. I just forgot about them. This year, in common with a number of bloggers, I’m going to try to read some of the books on the tbr shelves before I buy any more. I do have some pre-orders from the Book Depository which will arrive over the next few months but I don’t want to buy any books for a while. I also work for a regional library service so I plan to try waiting for books to arrive at work before racing off to the Book Depository & buying something that I’ve just read about or had recommended to me by the members of a wonderful online reading group I’ve belonged to for the last five years. 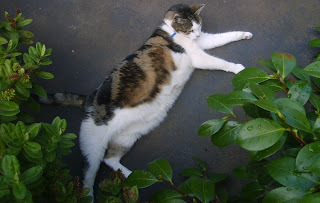 Cornflower is asking whether we plan to be slow readers (as recommended by Susan Hill in her book, Howards End is on the Landing) or fast readers this year. I’ve always been a pretty fast reader & I don’t think I can slow down the amount of reading I do as there are just so many books I want to read & reread. But, I’d definitely like to slow down my buying this year & savour what I already own. 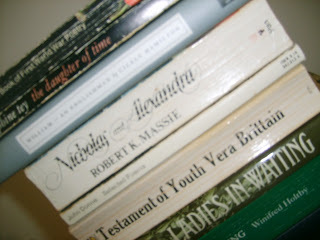 Hopefully writing this blog will also lead to a slowing down & an appreciation of what I read. 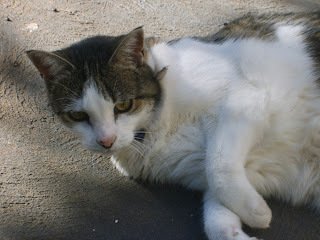 Abby used to live with my father, but, after he died just over 4 years ago, she came to live with me. She has me pretty well-trained now. 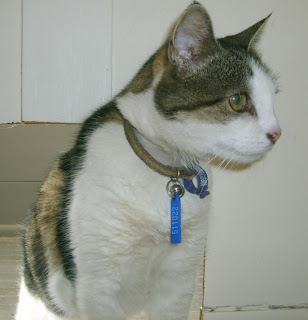 Food, a lap for sleeping on, lots of attention & doors opened when required – I’m able to handle all these demands now without fuss. Abby’s in favour of my reading habits, mainly because it means I sit still for long periods so she can sleep in peace. 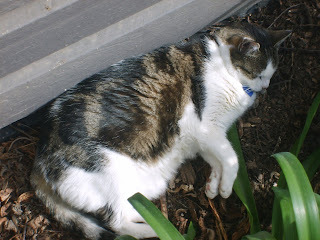 Neither of us enjoys summer, especially not the very hot summer we had in Victoria last year, so we’re both hoping for mild days to come & autumn to arrive as early as possible. Abby keeps me company & also endlessly amused. 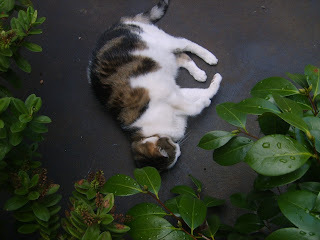 So, here she is asleep in one of her favourite parts of the garden & looking more alert. There will be more photos to come of Abby in her many moods. I'm on holidays from the library for a couple of weeks & it's given me the chance to do lots of reading. I was thrilled that this book turned up on Christmas Eve for me to borrow. Martin Edwards’ Lake District series is one of my favourites. I read the first three books in the series in a great rush a couple of years ago after Elaine from the blog Random Jottings recommended them & I've been waiting for the next one ever since. The Lake District is a beautiful setting for a series, the mysteries are intriguing & the protagonists are likeable. Daniel Kind is a historian who moved back to the Lake District on a whim in the first book in the series, The Coffin Trail. His girlfriend had died & he fell into a relationship with Miranda, a journalist. DCI Hannah Scarlett has been moved sideways into the cold case squad & feels her career is going nowhere. She once worked with Daniel’s father & this is the link between them at the beginning of the series. Their tentative friendship soon develops into an unacknowledged attraction, unacknowledged because of Daniel’s relationship with Miranda & Hannah’s with Marc Amos, a secondhand bookseller. At the beginning of The Serpent Pool however, Miranda has left & Daniel has just returned from a trip to the US. Hannah & Marc have moved into a new house needing lots of renovation. The house is near a folly called the Serpent Tower & the Serpent Lake where a young girl, Bethany Friend, drowned several years ago. Hannah is determined to find out what happened to Bethany & the cold case squad begins to investigate. If it was suicide, why would she choose drowning when she was terrified of water? When George Saffell, an obsessive book collector, is found dead among the burnt remains of his precious collection, Hannah is interested as he was one of Marc’s best customers. Was it an insurance scam gone wrong? But again, George was terrified of fire, so why choose this method? Hannah & Daniel begin to suspect a connection between the deaths & Hannah is disturbed to discover that Marc knows more than he’s told her about both victims. I love the way Edwards uses history & literature in the books. Here, Daniel is researching Thomas De Quincey which leads to discussion of his essay on murder as a fine art. The Arsenic Labyrinth was full of information about the arsenic industry in the 19th century. I love reading about Marc’s job as a bookseller & the details of the cold case investigations are also fascinating. This series is a success on several levels for me. The setting, the labyrinthine plots & especially the relationship between Daniel & Hannah keep me on tenterhooks for the next instalment. Martin Edwards also has a great blog, Do You Write Under Your Own Name? Yesterday morning I started reading a first novel, The Crossing Places, by Elly Griffiths. Late afternoon, I finished it. It combines mystery & archaeology, both of which I really enjoy reading about. Ruth Galloway is a lecturer in forensic archaeology living in an isolated cottage on Saltmarsh on the Norfolk coast. She's a loner, nearly 40, overweight, estranged from her born-again Christian parents. She's called in by DCI Harry Nelson to look at some bones discovered in the marsh. Nelson hopes they may be the remains of Lucy Downey who went missing 10 years ago but they're Iron Age. Ruth was involved in a dig near the site 10 years before when a henge was discovered. Now, she’s excited by the discovery of the remains & also hopes to discover the causeway that may link the two features. 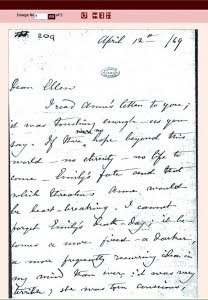 Nelson has been receiving strange letters since Lucy Downey disappeared & when another girl is abducted & he receives another letter full of mythological references, he asks Ruth for help. Ruth and Nelson are interesting characters, both essentially obsessed loners - although Nelson is married, he's not really at home in Norfolk, he only moved there from Blackpool because his wife thought he should go for promotion. Nelson admires Ruth’s professional detachment & there’s definitely a spark of attraction between them. At the end of the novel there’s an intriguing twist that will have an impact on their relationship in future novels in the series. I’d hoped for a bit more about the Iron Age body & the gold torques that were found with it but I suppose only so much can be crammed into a novel, especially a first novel where characters have to be introduced & the mystery plot has to keep ticking along. There were several subplots, all handled very well. I read the book very quickly & I had no trouble keeping track of who was who. The lonely atmosphere of the Saltmarsh was beautifully evoked especially when Ruth strays off the path & becomes lost on the marsh. Griffiths fills in Ruth’s past, the summer of the dig when she fell in love, her relationships with her mentor, the enigmatic Erik Anderssen, her work colleagues & few neighbours. The second book, The Janus Stone, will be published next month in the UK. I love footnotes. A volume of letters or a diary just isn’t complete without exhaustive footnotes, preferably right there at the bottom of the page so I can just glance down & check who or what the writer is referring to. Even when I think I know, I still like to check just to be sure. The only problem I had with Pepys’s Diary was that there were no footnotes. There’s a Biographical Index which had information about each person so if I forgot which William was which (this happened quite often), I could go to the Index & check. But, it just wasn’t the same. Two more of my best reads of last year were Christina Rossetti’s Letters edited by A Harrison & the Selected Journals of L M Montgomery edited by Mary Rubio & Elizabeth Waterston. The Journals had the notes at the back but Rossetti’s Letters had the footnotes right there at the end of each letter for instant reference. Some of my favourite books of all have been letters & diaries – Charlotte Bronte’s Letters (that's one of Charlotte's letters there), Virginia Woolf’s Diaries, The Mitford sisters’ Letters, Sylvia Townsend Warner’s Diaries, Dorothy L Sayers’s Letters (I still have several volumes of these to go), the selected letters of Keats, Vera Brittain, Frances Partridge... I also have some waiting on my tbr shelves that I really want to read this year. Penelope Fitzgerald’s letters, the letters of the Duchess of Devonshire & Paddy Leigh Fermor, Jessica Mitford’s letters & the selected letters & journals of Byron. Will they live up to my standards when it comes to footnotes? I hope so. I keep a list of books I've read. I've been doing this since 1979 so I've just completed 30 years of recording my reading. I usually come up with a list of my Top 10 books of the year but I could only come up with a Top 5 list for 2009. I read more books than usual, 172, but there weren't as many standout books for me last year. I reread quite a bit & these are always favourites, but I don't put rereads on my Top list. In 2009, my Top 5 was dominated by diaries & letters. I read the final volumes of Christina Rossetti's Letters & L M Montgomery's Journals. I've been reading these over several years, waiting for them to be published & then available through ILL & last year, I finally got hold of the last volumes. But, my book of the year was The Diary of Samuel Pepys. Only the Shorter Pepys I should add, although the Shorter is still 1000pp long. I would love to read the complete Diary now that I've had a taste, but living with Sam for the few weeks it took me to read this volume was a wonderful introduction to his world. It took a little while to get into the rhythm of the Diary & to work out who everyone was. The Diary begins at a moment of high drama in 1660 with the political machinations which will lead to the Restoration of Charles II. Pepys is actually in the fleet that goes to Holland to bring the new King back to England. From that moment, he's plunged into an immense amount of work as a hard working clerk to the Navy Board. He's a witness to many public events in the nine years of the Diary including the Great Fire & the plague as well as the Dutch War. His personal life is, if anything, even more fascinating. His love of the theatre, fine clothes & bad women is told with such honesty. This is what I loved most about the Diary. Although he was only writing for himself, he is meticulous in justifying every extravagance. He vowed he would only attend so many plays per month, but he's ingenious at getting around his own vow when he's desperate to see a performance. His sexual adventures are hidden, even from himself, in a peculiar mixture of French & Latin as if he can't quite admit to himself that he's behaving badly. He's honest about his sometimes shabby treatment of his much younger wife, Elizabeth, & enjoys describing his bodily ailments & their cures. The minutiae of everyday life for an up & coming clerk in government service is just fascinating. I also admired his pride in his success as he adds up every month how much he's worth. At the end of the book I felt bereft. Pepys stopped writing the Diary in 1669 because he thought he was losing his sight. Luckily, he didn't, but what a shame that he didn't resume the Diary. Imagine what we could have learnt about the rest of the reign of Charles II, the short, disastrous reign of James II & the Glorious Revolution. 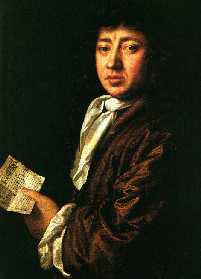 Still, I'm so grateful for what Pepys did write & that I have the whole 10 vols to look forward to reading in the future. Welcome to my blog. I've been a keen follower of literary blogs for a few years now & thought I would try a little blogging myself. I want to have a record of my reading, more than just a list of books read, & reviewing here will hopefully make me think more closely about what I read. 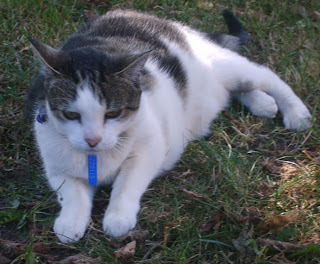 The adventures of my cat, Abby, will also make an appearance although, as she's 15, her adventures consist mostly of moving from one cosy spot for sleeping to another & demanding food & attention several times a day.